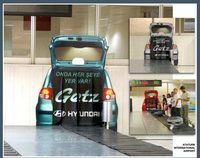 However, Hyundai must think it's money well spent as they hope that Sania will do for the Getz what Shahrukh did for the Santro. And close on the heels of the endorsement deal are the obligatory newsbytes. Clearly, Maruti seems to have understood how important the website is as part of a company's marketing arsenal. Fiat India could learn a whole lot from them. As I type this post, the number of Swift bookings made so far could safely be at the 15000 mark, going by the numbers it's been chugging since launch last week. Pretty much enough to have the folks at MUL leaning back in their chairs and grinning, I reckon. And not just for all the money that the Swift is going to make them, but possibly more for what the car promises to do for Maruti's image. There are of course, the naysayers who predict that the new kid on the block will now eat into the sales, or for that matter, the existence itself of some of the older inhabitants of the Maruti stables. But MUL's having none of that. With what's being now looked at as a two-month waiting period and with people willing to pay up to Rs. 25000 up front to make sure they get it sooner, it looks like the Swift has lived up to all the hype that preceded its arrival. Do we hear the Koreans shaking in their boots or worse, buckling at the knees? Hardly, as Hyundai doesn't even consider the Swift as being in the same segment as the Getz. It'd rather have it do business with the Santro for now!